Two years ago, my daughter Amy asked me if I would make her a quilt. I have only made two full size bed quilts previously. One was for my parents' 25th wedding anniversary in 1975, which I pieced and appliqued all by hand!! 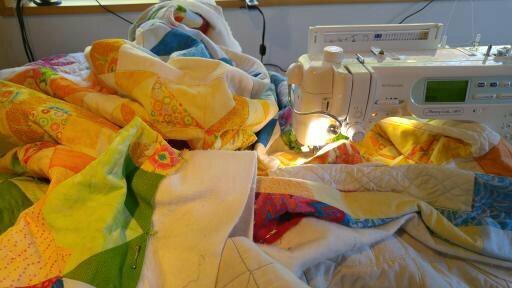 By the time I got to the quilting, I was a surgery resident working about 100 hours per week so my progress slowed down substantially - well it came to a standstill to be accurate. 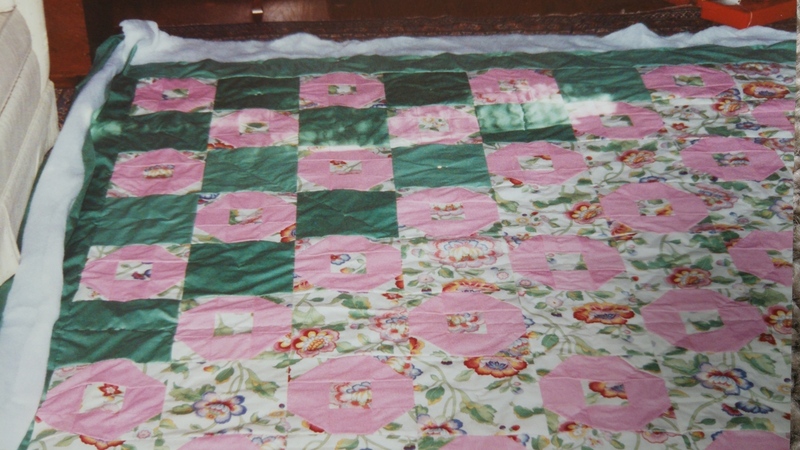 Eventually I paid a Mennonite woman in Ontario, where I lived at the time, to finish the hand quilting. She charged $50! It's still on a bed in the cabin in Georgian Bay although much faded now. 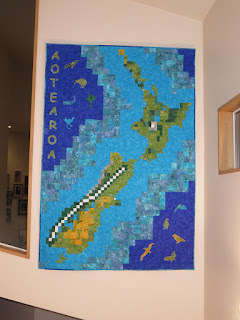 My second quilt was a wedding present for my sister and her husband back in 1990 and I did it all by machine. Much faster than making it by hand but of course, it doesn't look quite as good when you look closely. I managed to find an old photo that I took when I was basting the layers together but none of the finished project. And I did do a wall hanging quilt of the map of New Zealand a few years ago. It was full of 3 different sizes of squares and rectangles and let me tell you, the rectangles were a bit of a challenge! It turned out pretty well though and hangs in our stairwell. I think I made the Southern Alps a little too white though! You can't see them very well on the photo but I put buttons on the main cities including a sailboat button for Auckland (the City of Sails) and a heart button for Christchurch (home is where the heart is!). 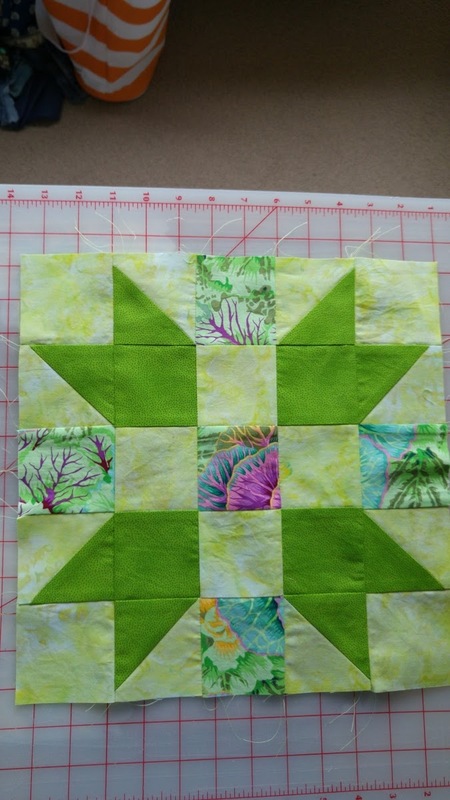 So in June 2014, Amy and I got together and designed her quilt using the 1-2-3 Quilt program. 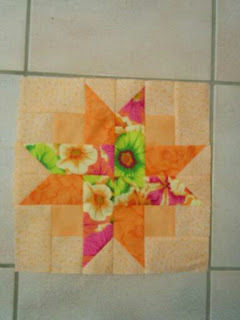 She chose 3 block designs - Star puzzle, Sister's Choice, and 4 Patch Block #1. She has a queen size bed and we planned a 6 x 5 block quilt with 12 inch blocks and 3 inch sashing plus border. Her mattress is 12 inches deep so it had to be quite large. Amy chose 5 colour schemes: blue, green, red, yellow and orange. As we live in opposite hemispheres, I had to choose the fabric but there were a lot of WhatsApp photos that Amy reviewed before purchase! 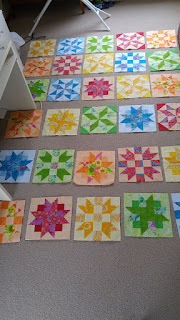 It took about a year of on again off again sewing to make all the blocks. Here are examples of two of the designs. Can't find a closeup of the third. It took about a year to finish all the blocks. 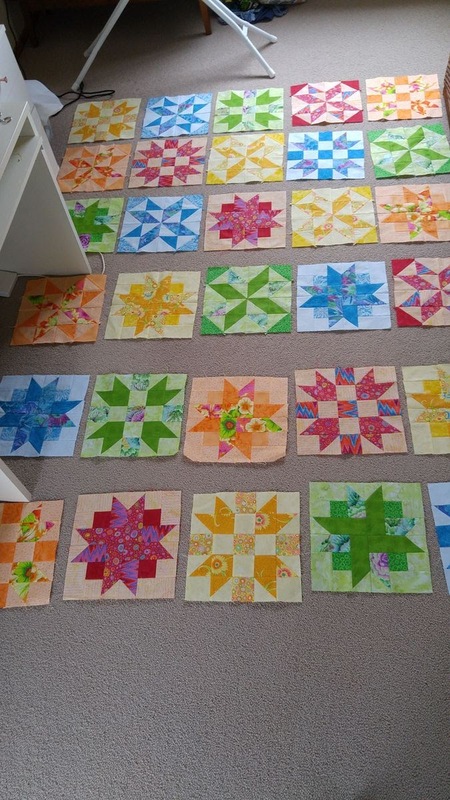 As the quilt was 6 by 5 blocks and there were 3 patterns and 5 colour schemes, it turned out to be impossible to create a symmetrical pattern with the blocks. So I just tried to strike a reasonable balance of designs and colours across the quilt - a good test for ignoring my perfectionest tendencies! We chose an off-white/cream colour for the sashing and I used the foreground colours from the blocks for the squares where the sashing strips met. 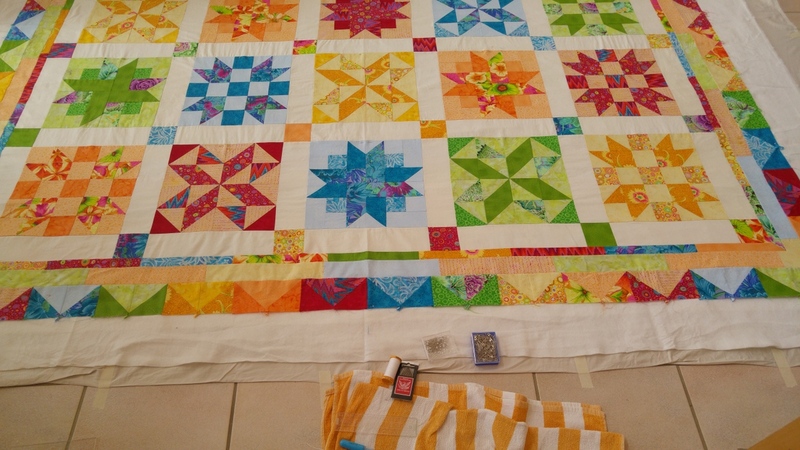 The quilt measured 94x79 inches before adding any border. I made the border 4 inches longer on the top so there would be enough quilt to cover pillows and used the leftover material from the blocks. The final size before binding and quilting was 107 x 95 inches. I bought a king size sheet for the backing and it wasn't long enough so I added some coloured strips at the top. That way it would look more interesting when the quilt top was turned back on the bed. I taped the backing onto the tile floor in our front hall, then added the batting (polyester as Amy is allergic to wool) and the quilt top. 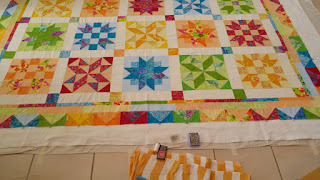 I pinned all the edges and across the middle than hand basted at 5 inch intervals. I should have basted a little closer together I think, especially as the sashing fabric turned out to have a little more give than I would have liked. After 8 hours on my hands and knees over 2 days, I was ready to quilt! 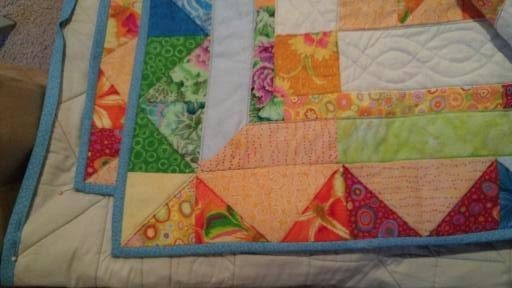 I quilted by machine using a walking foot, 2.5 mm stitch length, and stitched 1/8 inch from the seams of the main block pattern pieces using cotton quilting thread that matched the block main colour. I used a variegated thread along the edges of all the sashing. Wisely or unwisely, I decided to put a pattern in the sashing. I chose a cable/rope pattern and, becasue I knew I wouldn't be able to sew it perfectly, I used off-white thread to match the fabric. I made a little loop design so that I could continue across the whole width of the quilt. I traced the pattern onto the fabric before quilting it using a non-wax based carbon paper that I had bought in Toronto a couple of years ago. Unfortunately I ran out and had to buy some wax based carbon paper here in Christchurch and some of it was difficult to remove. 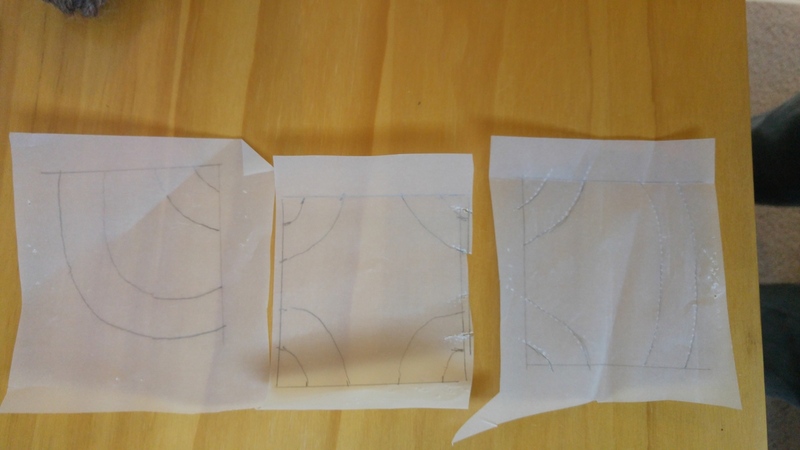 When quilting the rope pattern, it turned out to be very diificult not to push up folds in the fabric, even using the walking foot. So there are a few, well more than a few, ugly bits. It was quite a mountain of fabric to manipulate under the sewing machine. I think next time (if there is a next time! ), I'll quilt it by hand and not worry about how long hand quilting takes. After the quilting I added a narrow blue binding. The different colours of quilting thread look kind of cool on the back of the quilt but I didn't remember to take a picture of it. 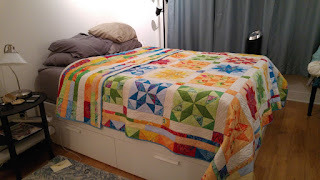 After quilting for about 5 hours a day for 10 days, I finally finished just in time to take it with me to the US in June. I had to put off taking out all the basting threads and washing off all the carbon marks until after I got there. I wish I had a photo of Amy and me hanging over her bathtub desperately trying to scrub out all the markings. 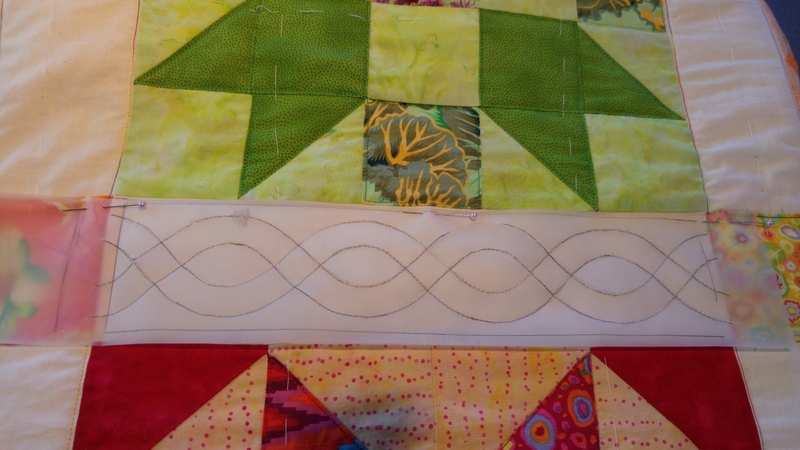 Then to my horror, I discovered I hadn't quilted one of the 4 seams on one of the sashing rectangles. Fortunately I have a good friend in California with a sewing machine and I had brought along my various colours of threads just in case this type of scenario occurred. 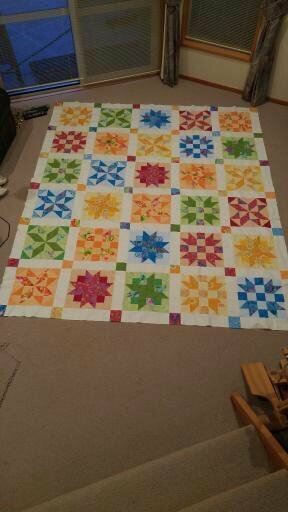 So at last, after a couple of days of drying, the quilt was finished. I almost forgot to take a photo but managed to throw it on the bed just before I left town. Ta da!